1) The battery compartment is located on the bottom of the Smart Lock. 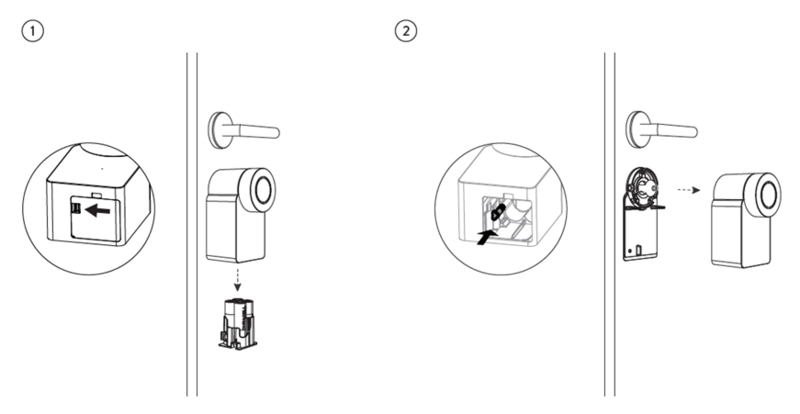 To open it, press the small lever in the arrow direction and take the battery compartment out of the Smart Lock. 2) When the battery compartment is removed from the Smart Lock, a coloured bolt is visible. Press the coloured bolt in the arrow direction to the inside, so that the bolting is released and you can take the Smart Lock from the mounting plate.